Joyride. When we hear the word we’re 15 again. Our driver’s permits burn a hole in our pockets as we remember riding around in our parent’s cars with the windows down, fanning freedom’s flame with the prospect of the open road. In those moments fulfillment comes easily. Innocence is made vulnerable and although we peer into the rearview mirror, there’s no going back. 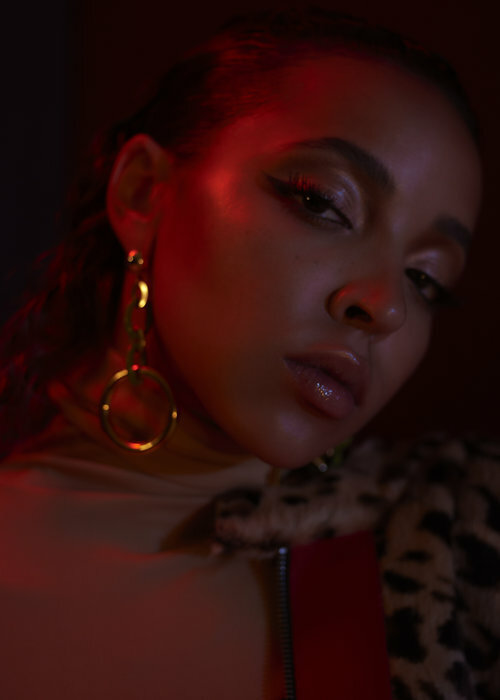 As the name of her sophomore album, Joyride is fitting, if not idealistic as Tinashe goes the distance -- with herself as both the vehicle and the fuel. Although the album’s release has been teased since 2015 and only recently hit the airwaves in April of this year, Tinashe’s handled setbacks like detours, navigating her way through the music industry along the daunting, winding roads of the creative process itself. 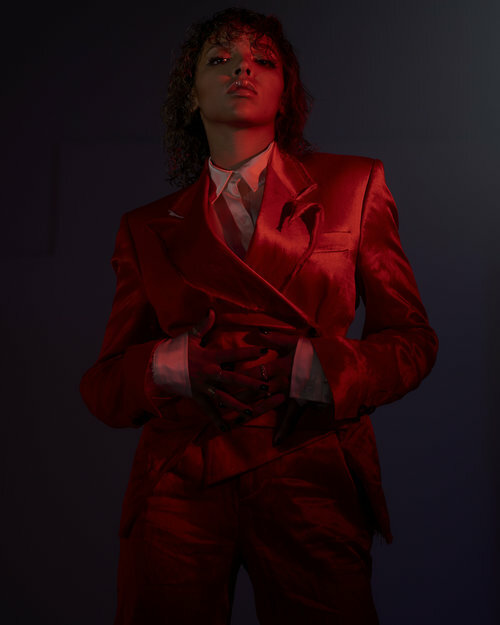 For the rising American, pop-icon who has become comparable to the likes of Aaliyah and Janet Jackson to some critics, there’s never been a Plan B. Even if she didn’t always feel totally in control, she never loosened her grip on the steering wheel. There were lights up ahead. It’s often inevitable that as we drive along life’s roads, we find ourselves farther from home than we’d like. Surely, this is the case for someone like Tinashe, a growing phenomenon in the limelight, yet, she begs to differ. Tinashe equates her sense of self with her roots. These same roots weave deeply into the soil from which her family tree blossoms and serve as her compass. Forever tethered to this grounding and guiding force, Tinashe has found that no matter how far she goes, or where, home is always with her, allowing her to strike a nuanced balance between who she was, who she is and who she wants to become. NR MAGAZINE: I think it's interesting because when we think about control, by definition it's the power to influence. For you I know know family is something that's really important and influential, yet, you’re a huge star. How does that dynamic work? 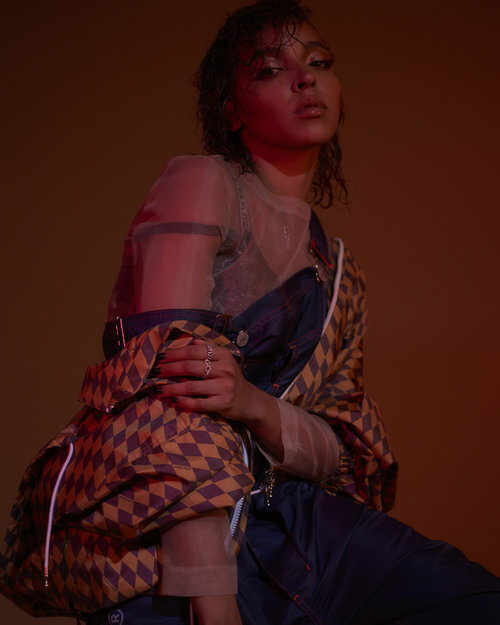 Tinashe: I mean I think you kind of hit the nail on the head, family is pretty much the overriding biggest influence on my life, my career and how I just kind of go about doing things. I keep my circle really small and that's something that I've always done. I always have this sense of wanting to trust the people closest to me the most. My best friend I've had since I was eight years old and those things are really important to me for sure. NR: Yeah and obviously those relationships by default, change based on your career and all the mounting success that you've found. Do you feel “in control” of those changes and the time you get with them? Or do you feel like you’re having to fight for them a little bit? T: Interestingly enough that’s one of the best parts about having relationships like these because I know they’ll always be there. That sense of permanence never goes away no matter how often I see them or speak to them or am able to connect with my friends and family and it always remains the same, in terms of our dynamic. That’s really important in keeping me grounded and feeling like myself. NR: Backtracking a little but when you hear the word “control”, what does it mean to you? And what aspects of your life and career are you fighting for control over? T: I think I just want to have control over my own happiness and my own decisions. I want to be able to own the things that I do and the choices that I make. I don't want to be influenced by any kind of outside force, whether that be a record label, or the media, or my fans. I want to just be able to be free in how I express myself creatively as an artist and how I live my life because that’s what I truly feel is the core of being an artist and I want to be able to tap into that instinct. NR: It's interesting you bring up the word freedom because I feel like that’s innately tied to honesty. Honesty might be the biggest form of like control that we have because it allows you to align your actions with your feelings and set yourself up for full-fledged fulfillment. T: I'm always learning, I think it's a growing process and I don’t really have the answers especially in this industry. I think it's just following the things that you love about it, the music, performing, connecting with people — those things are the core elements and everything else just falls into place. You never really know what’s going to happen and you kind of just have to take everything as it comes and be able to find the beauty, find the lesson and take in the experience. NR: You've always said you know there is no "Plan B”, but are there are there moments when you’re on the road, in the studio, and just plain busy, that you feel that you would give anything to be at home? Is homesickness ever a thing for you? T: It's funny, you always miss the part of the process that you're not doing. When I'm on the road, I miss being in the studio. When I’m in the studio, I miss being on the road and there’s always that kind of dynamic. I think the thing about family is that they’re the people that I feel the most comfortable with so when I do travel, I try to bring my family with me if possible. NR: Yeah and sacrifice is perhaps being made on both sides of those relationships and if you kind of talk about aspect of your relationship. Have you ever felt guilty ever? You never want to feel like their support is at their expense but at the same time they’re so eagerly ready to support you in such a genuine way. T: Yeah, I mean that's always how it's been with me, they've always had my career as a top priority in our lives, in my whole family. It’s been incredible to see my parents working so hard to give me the opportunities to follow my passion. They've always had that belief system in me and it’s instilled so much confidence and I try to reciprocate in whatever ways I can. I’m forever indebted, there’s no way that I could ever repay them for supporting me as I grew up. They enjoy being able to travel, do cool things with me and do spend as much time as possible so it’s all good. NR: I know you've got two brothers, it must be such a special thing to see them grow up. What does it mean to be a sister? and it feels like you are also kind of like you know a force of influence over them and who they are. T: I love my brothers and I’ve also always had that kind of underlying support them and that has been such a blessing. We all support each other and it’s so special and important to me and I love to be able to spend as much time with them as I can. It’s been great to be so close with them growing up and being able to live with them in the same house, seeing them go off to college and have their own experiences and that’s really important to me to be able to share those things with each other. That's everything for me I mean like the core of who I am and the core of how I’m able to maintain staying grounded. NR: What do you think success means? Obviously it’s the picture of the Grammy as your screensaver on your phone but for you it must be so multifaceted. T: I think the core of it is just being happy, feeling good about whatever it is that you're doing and then those goals are just check marks along the way. But successes yeah, it is yeah objective, it changes all the time. I think for me it’s being able to just make the best music that I can by tapping into that creative place in me where I can feel totally like myself, the best version of myself that I can be. NR: What kind of environments do you feel like spawn like the most creative freedom for you? What does that place look like? Can it be anywhere? T: For me I mean it can be anywhere, I can tap into it in different places but for me I'm most comfortable when I’m in the homiest environment like a bedroom-home studio. A cozy kind of vibe is most conducive to how I create but I can do it either way. NR: Why do you think that is like for you personally? Writing is also a huge act of failing a lot of the time so I imagine you need to be in some place that is forgiving. T: Yeah it’s the process that’s so important and being able to go through it, I think you need to be somewhere you feel vulnerable and for me that’s home. NR: Home is obviously something that means a lot to you and it can be a feeling and also a place. For you what is it and how do you manage to take it with you wherever you go? T: I think it's having those relationships and strong bonds and knowing that those things are never going anywhere no matter where I go. Those things are kind of important to having that feeling of home all the time.